Ensure a hassle-free start or end to your family vacation with a pre-arranged arrival transfer between Charles de Gaulle or Orly airport, and your Disneyland® Paris hotel. 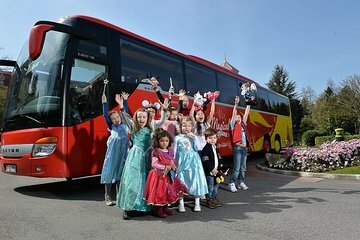 A shared transfer is the most cost-effective way to travel, with regular shuttle buses that are easy to reach from the arrival terminals, and drop-off at either Disneyland Paris bus station or your hotel. Pick-up point at CDG not very well displayed. Once we found service counter only a short wait for next bus. Bus service was on clean, modern coach with clear announcements to destination. Being picked up right outside your Disney hotel and being dropped outside the departure terminal at the airport is extremely convenience - definitely worth while.